Bali Pass is a breathtaking high altitude pass at 5000 mts offering amphitheater views of Kala Nag, Banderpoonch & Swargarohini peaks. The trek to Bali Pass offer mesmerizing Himalayan views that takes one through verdant meadows, lush green valleys, isolated and peculiar Jaunsari hamlets and deserted terrains to reach Bali Pass. Wooden architecture of Jaunsar villages, surreal Ruinsara Lake and a visit to Yamunotri Temple makes Bali Pass a must do high altitude trek. A high altitude pass meant for all the trekkers who want to upgrade to expeditions. Variation in scenery considering the fact that it starts in Sankri & ends at Janki Chatti. A visit to Yamunotri Temple, source of Yamuna River. Jaunsar Villages are a beautiful mystery. Gets you up, close & personal with lofty Kala Nag, Banderpooch & Swargarohini Peaks. Region: Bali Pass located in Uttarkashi district and comes under Govind Ballabh Pant Wildlife Sanctuary. Bali Pass trek can be approached from Mid May to June End and early September to October Mid. The weather will be unpredictable during monsoon season and during winters the region will be exposed to heaps of snow. Bali Pass is at an elevation close to 5000 meters,so, it will be better if you had a prior trekking experience. It better to train yourself two-three months prior to participating in the trek. If possible, arrive a day or two before you begin your hike to acclimatize yourself to the high-altitude climate and weather conditions. Hire an experienced trekking guide to accompany you in your trek. These guides have much knowledge and expertise about the route. Situated in Govind Ballabh Pant sanctuary, trek to Bali Pass is a memorable one. At an elevation of 5,000m don’t expect a shed, let alone a lodge. Tents are your best bet. One can hire tents or even take their own when on a trekking expedition to Bali Pass. Again, it is not possible for anyone to hold an eating joint at Bali Pass as it is a place with uninhabited by people at all. Trekkers can take the food supplies with themselves that they can purchase at lower altitudes,preferably before starting the trek. A cook can prepare a delicious cooked meal provided the entire ration is taken with. 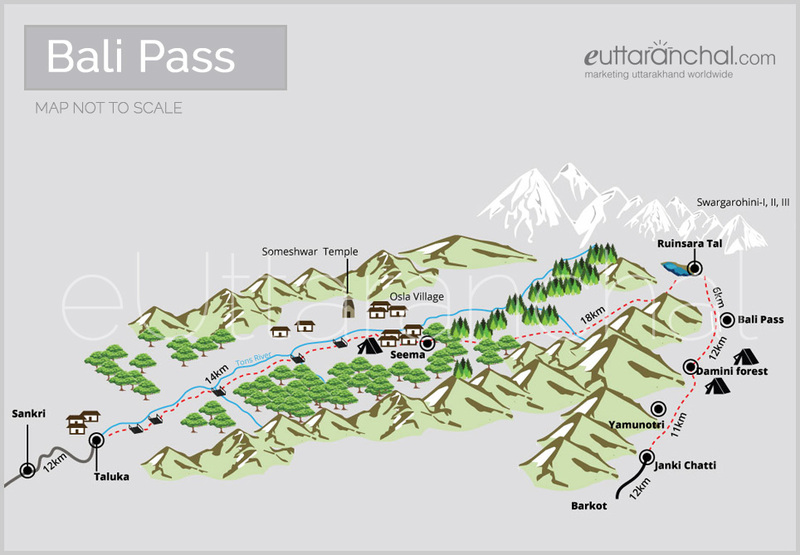 What is Bali Pass famous for? Bali Pass is famous among tourist as Trekking, Expedition. Bali Pass is recommended destination for Foreigners, Groups. Bali Pass is popular destination for following activities/ interests - Adventure, Trekking. Travelling to Bali Pass in 2019? Contact us for planning your Bali Pass tour with best travel packages of as per your requirements!